Naim Audio Mu-so wireless speaker review: Expensive? Very. Worth it? Oh yeah. Blue Microphones made a name for itself building top-shelf USB mics. Now the company is here to demonstrate that it can do phenomenal work with analog audio going in the opposite direction. 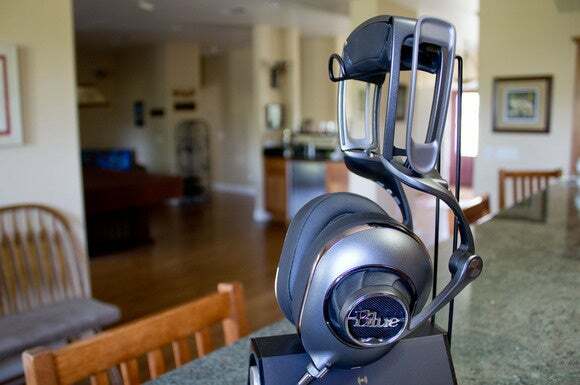 Take one look at Blue’s Mo-Fi headphones, though, and you’ll see that their engineers were thinking of much more than building headphones that sound good. The Mo-Fi’s strut-like exoskeleton resembles the suspension system on an exotic supercar. Fabricated mostly from aluminum, the headphones have six flexible joints to ensure a custom fit no matter the size of your noggin or the distance between your ears and the top of your head. A tension dial on the top back of the generously padded headband lets you dial in an even more perfect fit—not too tight and not too loose. 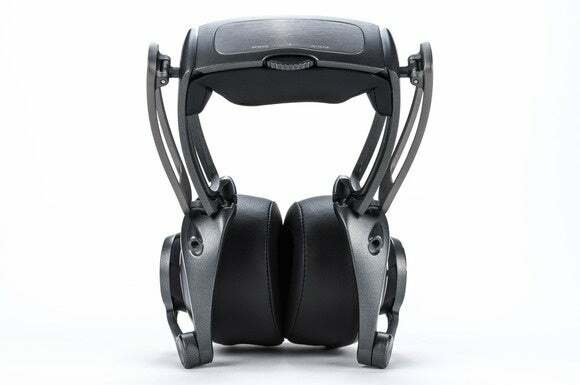 The circumaural ear cups, which house large 50mm fiber-reinforced drivers, boast an inch-and-a-half of foam padding to block environmental noise and prevent the sound leakage that can annoy people in close proximity or cause feedback in an audio-recording session. Despite their 1 lb., 2 oz. bulk, I found these headphones to be extremely comfortable even during long listening sessions. The Mo-Fi's unique suspension-like design, generous padding, and tension wheel ensure a comfortable fit even during long listening sessions. Two items catch your attention when you examine the Mo-Fi’s left ear cup. The first is a micro USB port, and the second is a small switch on the headphone cable jack. The Mo-Fi have a built-in analog amplifier, and you use the switch to select between its three modes (off, on, and on+). The USB port is there so you can charge the amp’s 1020mAh battery. With the amp disabled, the Mo-Fi’s perform as passive headphones. Enabling the amp boosts the headphones output power by 240mW, while switching to “on+” boosts bass response for those who really like to thump. Blue claims the battery can deliver 12 hours of active listening time, but closing and opening the headphones automatically turns the amp off and on respectively (if the switch is in the “on” position) to reduce drain on the battery. The Mo-Fi’s are not at all difficult to drive, presenting just 42 ohms of impedance to the source, so I never found it necessary to engage the amp. Turning it on didn’t introduce any noticeable distortion or anything else objectionable, but it did significantly increase the loudness. A warning tag attached to the phones wisely advises turning the amp off or removing them entirely when plugging into or unplugging from an audio source. 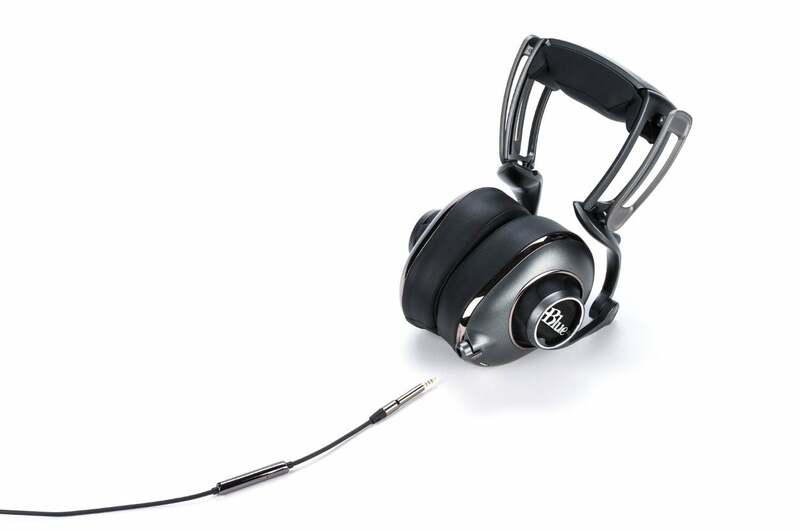 I listened to these headphones on a fifth-generation Apple iPod touch, an HTC One M8 smartphone, and with Creative’s awesome Sound Blaster X7 DAC and headphone amp and never really found the amp necessary in any of those scenarios, but you might have a different opinion. 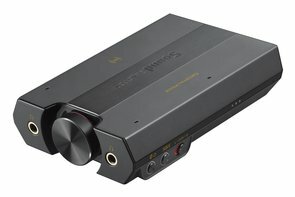 I used Creative's Sound Blaster X7 USB DAC and headphone amplifier for some of my listening tests. The device provides a handy place to store your cans when you're not using them. Blue puts a full complement of accessories in the box with the Mo-Fi’s. The audio cable is removable, and two are provided: A 9.8 ft. cable, so you can connect it to an amp in your entertainment center and sit in your favorite chair; and a 3.9 ft. cable with Apple iPhone/iPad/iPod controls. A 3.2 ft. USB charging cable and USB charger, a 1/8-inch-to-1/4-inch audio adapter, a two-prong airline adapter, and a soft carrying case are also included. Both cables are straight, but are wrapped in neoprene or some other rubber-like substance to resist tangling. The cable plugs are gold plated to resist oxidation. I listened to a wide variety of music while evaluating the Mo-Fi’s, including rock, pop, folk, funk, and classical. Tower of Power’s eponymous release Back to Oakland is one of my favorites, and I listened to this album ripped from CD and encoded in 16-bit/44.kHz FLAC. I was immediately struck by the details I could hear in this recording. A drum kit consists of eight and often more instruments: There’s the snare, a pair of tom-toms, a floor tom, the bass drum, a ride cymbal, a crash cymbal, and a high hat. On lesser equipment, those individual instruments are all too often lost in a mix. Listening to “Squib Cakes,” I could hear every impact of master drummer David Garibaldi’s sticks no matter how nuanced and no matter what else was going on—and there’s a lot going on in this recording. I had to turn down the volume at the source when I engaged the headphones' internal amplifier, which obligingly boosted the electric bass and kick drum when flipped over to “on+” plus mode—without muddying anything up or losing a whit of clarity. I selected a couple of high-definition recordings for my next test, selected from Bowers & Wilkins’ Society of Sound music service. Listening to “The Lass of Glenshee,” from Cara Dillon’s Live at the Grand Opera House, encoded in 24-bit/48KHz FLAC, I marveled at how clearly Dillon’s divine vocals came through as various instruments joined the fray. The song starts with just an acoustic guitar accompaniment. A low-pitched drum joins in with the second verse, and strings enter in the third. The fourth verse starts with a wooden flute and the song continues to build in intensity from there. But Dillon’s voice came shining through the accompaniment. Turning the integrated amplifier on significantly boosted the loudness, but I couldn’t hear much of a difference in bass response with the “on+” setting engaged on this track. The Mo-Fi have a removable cable, and the headphones come with two: A standard audio cable and one compatible with Apple's iPhone, iPod touch, and iPad. My second high-def choice was the first movement of Hector Berlioz’s Symphonie Fantastique, recorded by the London Symphony Orchestra directed by Sir Colin Davis. Another Society of Sound selection, this recording was also encoded in 24-bit/48kHz FLAC. Classical music can be challenging for any audio system, because of its extremely wide dynamic range, but the Mo-Fi’s handled the recording with aplomb. The strings, brass, woodwinds, and percussion were presented in the same superb detail in the quietest passages as they were in the most flamboyant. I never felt the urge to kick up the volume in the quieter sections because I thought I was missing something, and I didn’t need to turn it down in the louder sections because I felt as though I was being overwhelmed. While I didn’t find the built-in amplifier to be all that necessary, I didn’t feel as though I would be paying for a feature I didn’t need if I bought these cans. Blue’s industrial design and build quality, the accessories they include, and—above all—the Mo-Fi’s magnificent performance—add up to an impeccable value. These are magnificent headphones. My sole reservation has to do with their bulk. If you’re looking for on-the-go headphones, you might find the Mo-Fi’s to be a bit much to stash in your backpack. 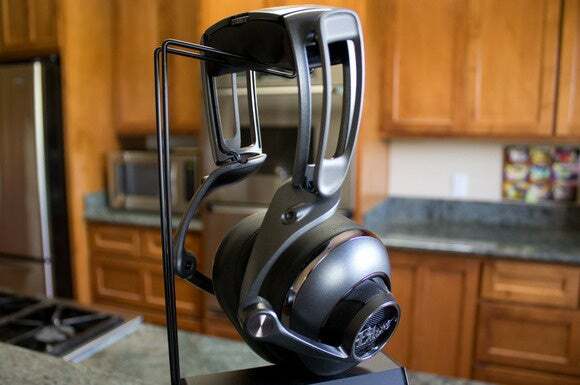 And while some full-size headphones can rest comfortably around your neck while you’re not listening to them, these don't—I could barely turn my head with them there. On the bright side, however, you won’t feel the need to pack a portable amp with you. These headphones look and sound exceptional, but the strut-like design renders them somewhat poor travel companions.